I have heard a lot of people describe how they need their morning coffee to “get going”. Some are writing about the benefits of Bulletproof Coffee. I have personally not drank coffee for over 20 years. I was forced to stop drinking it in my 20s because it was causing me unpleasant digestive symptoms including stomach cramps, diarrhea, and bloating. Even before my real food diet came along some years later, I decided coffee wasn’t a good choice for me. So I looked for other beverages to fill the space. Back then my hot beverages consisted of hot chocolate, black tea, and some herbal teas. I soon found, however, that as I also wasn’t eating a nutritious breakfast (usually peanut butter on toast or a Yoplait yogurt product) that my blood sugar would soon drop and I would not feel well and also was cranky and hungry again in about an hour or two. As time went on, I realized my digestive and other health issues were not just happening because of the coffee I drank in my 20s. The “food” I was putting in my body wasn’t actually food. I started to replace processed products I had been eating for breakfast (and the rest of my day, for that matter) such as bread with peanut butter and sugary, commercial yogurt with real food. What a difference it made! My typical breakfast now consists of pastured eggs cooked in butter, yogurt or cheese, sometimes fruit, and sometimes pastured sausage or bacon. I also usually have a fermented food of some sort such as sauerkraut or kimchi. But I digress. This purpose of this article is about nourishing alternatives to coffee. So back to that. When I discovered the healing and supportive power of fermented beverages, those became something I included every morning before and with breakfast. I also learned how satisfying and healing other liquid foods were such as homemade bone broth and nettles infusions. Why drink homemade fermented beverages, bone broth, and nettles instead of coffee? Along with real, traditional foods, these liquids support healthy blood sugar levels, digestion, the immune system, mood, energy and, and our ability to focus and remember information. Although you can find plenty of evidence and studies lauding the benefits of coffee, any caffeinated beverage is an appetite suppressant and has been found to diminish the store of minerals in the body, especially magnesium. According to Dr. Carolyn Dean M.D., the author of The Magnesium Miracle which I recommend via Amazon affiliation, coffee not only causes magnesium depletion, but also “insomnia, nervousness, restlessness, irritability, stomach upset, fast heartbeat and muscle tremors.” I can personally agree with this statement as I had those symptoms for years while I was consuming coffee, as well as beyond that until I healed my body from brain and nervous system disruption with the GAPS Diet. Kombucha is a fermented tea made from a mushroom or SCOBY (symbiotic culture of bacteria and yeast), and is beneficial in many ways. Unlike carbonated sodas, kombucha is naturally effervescent due to its fermentation, and can be much lower in sugar the longer it is allowed to brew. It is a source of vitamins, minerals, and probiotics which support digestion, immunity, brain and nervous system function and overall well-being. You may be wondering why I would recommend a beverage containing tea, which like coffee, contains caffeine and could be depleting of minerals in the body. When the SCOBY is placed in a jar of freshly brewed and cooled tea that has had already had sugar added and dissolved in it, the SCOBY consumes the sugar in the tea and via fermentation, naturally causes the effects of the caffeine to become neutralized. Our family brews a brand-new batch of kombucha daily so that we always some on hand. It also much more economical to make your own kombucha rather than purchasing commercial kombucha. When making your own, you have control over brewing time which means you can ensure more probiotics and less sugar content in your tea than what you would find in the commercial variety. Longer brewing time typically means less sugar and more beneficial bacteria, so making your own at home is not only cheaper, but preferable in terms of health benefits. I recommend Kombucha Kamp for all your kombucha-making needs and educational information. Follow this link to sign up for their newsletter and get a free DIY guide and e-book! Beet kvass is a fermented beverage made from beets which originates from the Ukraine. Beet kvass is a potent liver detox beverage and contains probiotics, minerals, and enzymes which are especially supportive of our overall well-being. This beneficial liquid can make your digestive and immune systems very happy indeed! It is one of the simplest of the fermented beverages to make, although it can take some time to complete depending on how long you choose to ferment. I have made beet kvass using different methods: in Mason jars for a few days and in anaerobic environments with airlocks for weeks as recommended by a number of experts in the fermentation field. There are differing opinions on the optimal way to prepare this bubbly beverage. If you have never made beet kvass before and want to try it, I recommend using a Mason jar and seeing how the process works with this basic recipe from Feed Me Like You Mean It. For lids, I recommend discarding the metal ones which come with the Mason jars and using these BPA-free, plastic mason caps with silicone seals from Primal Kitchen, or these from Tulid which only contain two substances: rubber and silicone. (both via Amazon affiliation). For more information on beet kvass, visit the Weston A. Price Foundation. Nettles are a healing plant that have been used for culinary and medicinal uses for thousands and thousands of years. Depending on the location of where the plant is harvested, stinging nettle is a rich source of minerals including iron, calcium, and potassium, sulfur, lime, zinc and phytonutrients. This useful plant has even been added to the diets of cattle and chickens to increase milk and egg production! Among its versatile functions, it has been used as a an aid for allergies, blood purifier, liver and digestive aid and detoxifying agent, for skin irritations, to help clear mucous or as a gargle for throat irritation during illness, as a hair and scalp conditioner, and to boost milk production during breastfeeding for nursing mothers. Nettles infusions are a refreshing, hydrating, and easy-to-absorb way to replenish the body with needed minerals, which makes the beverage ideal for morning consumption or following exercise, sweating, or exertion. Here is my recipe for nettles infusions. Although this is not the exact recipe from Susun Weed’s site for infusions, this is how we make it. You will need dried nettles for this recipe. I recommend these organic nettles via Amazon affiliation. Alternatively, you can find these locally from a farm or harvest them wild. Susan Weed does not recommended adding other herbs to your preparation. We add mint to ours because my son and husband will not drink nettles without it as they don’t care for the taste. Get a glass container, which could be a quart-sized or or larger. I normally use either a half-gallon or gallon size, depending on how much I want to make and know my family will consume. Cover the bottom of the with nettles. I don’t usually measure, but Susan Weed recommends using one ounce of nettles for a quart, and if you are making a gallon you would then use four ounces. However, I recommend experimenting to see how much you like, as using less will make the infusion weaker, whereas more will make it more potent. We add 2/3 cold water to the herbs and 1/3 hot water from the kettle on top. Susan Weed recommends using all boiling water in her preparations. An infusion is not to be confused with most tea that is steeped for just a few minutes in a pot or cup, and extracts the desired elements into the water due to the long amount of time the mixture is infused. b) you can simply store the finished infusion in the refrigerator as is, and use your strainer each time you pour a glass. Our family prefers option b as we don’t always have another clean vessel available to use. I recommend using nettles infusion up within a 24 hour period as the potency of the minerals and other nutritional elements diminishes rapidly once it is made. You can still drink the infusion beyond 24 hours, but know that benefits will be lessened as time goes on. As authors of the cookbook I’m recommending via Amazon affiliation, Nourishing Broth Sally Fallon Morell and Kaayla Daniel have explain through history and science: broth made from the bones of beef, lamb, bison, chicken, turkey, or other animal or bird raised on pasture is nutritive and health-supporting for the following reasons: it contains minerals, amino acids, collagen, and gelatin, all of which are essential to health and healing of the digestive tract, supportive of immune system health, and easy-to-absorb. I have a cup of broth at least several times weekly. Of course, broth has many more uses than just to sip in your morning mug. You can also use it in soups, stews, casseroles, for reheating leftover meats/poultry/fish and vegetables, and myriad other uses. We keep jars of broth in our refrigerator regularly for these purposes, and wouldn’t be without them! Try having a mug of broth in the morning instead of coffee before or with your breakfast, and see if you don’t notice a difference in how you feel physically and mentally! Dairy kefir is a probiotic beverage made from kefir “grains” which aren’t actually grains at all. They are traditionally prepared with cow’s or goat’s milk from animals raised on pasture. This highly nutritive drink contains probiotics, vitamins, minerals, enzymes, and like other beverages discussed here, is beneficial to the digestive tract and immune system. Water kefir is made with organisms which exist in a colony of bacteria and yeast. Their appearance is quite different than dairy grains, and are translucent in appearance. These also contain beneficial bacteria, vitamins, minerals, and enzymes for better health. Like kombucha, kefir beverages are another raw and health-boosting food as they contain probiotics, enzymes, vitamins, minerals, and other nutrients that are beneficial to our well-being. Here is a recipe for dairy kefir from the Weston A. Price Foundation. Here is a recipe for water kefir from Mother Earth News. Smoothies are a good way to include many nutritious foods at once, and are especially convenient if you are in a hurry and don’t have time to cook a large breakfast but want something to give you energy and sustenance for your busy day. Add yogurt, kefir, whey (optional), raw colostrum (optional), raw cream (optional), berries or other fruits into a blender. Blend all ingredients in food processor or blender starting with the dairy ingredients and fruit. Gradually add in other ingredients one at a time such as avocado, then egg yolk, and honey and oil last so it won’t gum up your blending appliance. Pour smoothie into a glass and and enjoy! Unlike coffee and other caffeinated beverages, these nourishing and beneficial drinks are a rich source of vitamins, minerals, probiotics, amino acids, enzymes, and probiotics that are health-supporting. What alternatives do you consume instead of coffee? What are your favorite gut-healing and supporting beverages and foods in the a.m.? If she’s going to use the word infusion for her nettles brew then she should advocate making it properly with one full ounce of herb to get maximum benefit. She uses far too little herb to be called an infusion. Makes a huge difference! Hello Becca – I used the word infusion in this article because it follows Susun Weed’s directions for preparation which states to allow the preparation to sit for 4-8 hours, or overnight. Our results are always very dark and potent, and I think we obtain similar benefit as the directions given on Susun’s web site. I may not always use exactly one ounce in my preparation, and sometimes I actually use more as it depends on the dried herb I use: whether it is powdered or whole leaves. Sometimes I use both. The powdered herbs end up being more than one ounce in most cases in the amount I’ve discussed here, as it takes a lot of the powdered form to fill the container. I totally admit to loving coffee but I really try to not let it be my focus. (Even if I do joke about it!!) I love these options and they are so good for you. Hi Jessica – I think it’s perfectly fine to drink coffee sometimes, and I know plenty of people who do and seem to have no ill effects. But I am always concerned by some that I know who drink 3-5 cups daily. That seems like too much. I think coffee has some very addictive qualities to it as well as the mineral depletion action, so it makes me wonder if mineral depletion is actually related to the amount of coffee many people drink versus just having one cup. Since so many have challenges just having one cup, it also makes me think there might be a connection to the amount consumed. Very informative post. I usually enjoy a cup of green tea in the morning, which still has caffeine but is not harsh on my body like coffee is. I am interested in the nettle infusions since I am prone to seasonal allergies and skin irritations. Thanks! 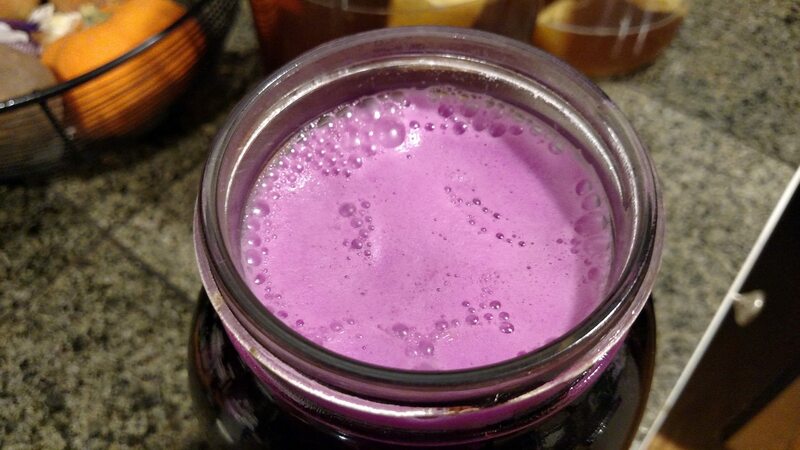 My day starts with beet kvass blended with fermented turmeric drink. Thanks for all of these great ideas. Hi Andrea – thanks for stopping by! I love that you start your day with a fermented drink. Most days, I do too! Beet kvass or kombucha, or both! Yes, I love the distinction you make: the food we put into our bodies needs to be food. (Seems obvious but pleasure, modern culture, what’s available and convenient– these things take over.) Otherwise it can’t nourish and sustain us. Eventually disease will happen. Thanks, Raine, for sharing these nourishing brews. Just remembered I need to be integrating more fat into my smoothies. Thanks for the reminder! Love this!!! I enjoy so many of these drinks too – water kefir, kombucha, smoothies, nettle infusions, broth and more.